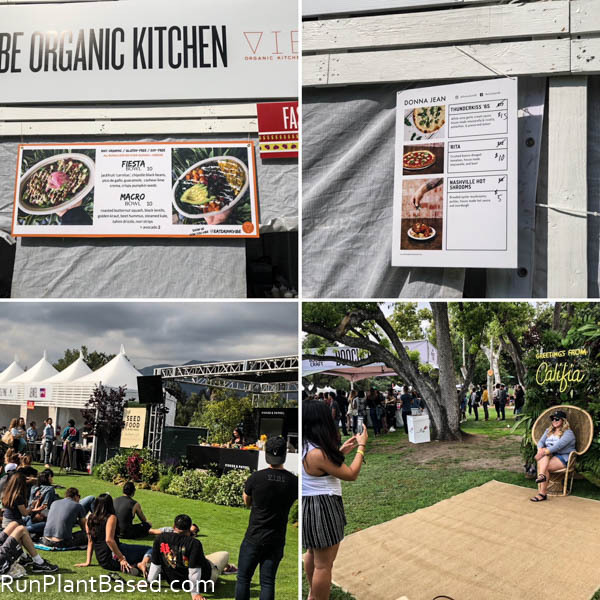 Where to start on the Eat Drink Vegan festival, there was so much it was overwhelming! How about on the morning of the festival when I should have been pretty tired after a long day at Universal Studios the day before. But oh no, I woke up wired well before 7 am. 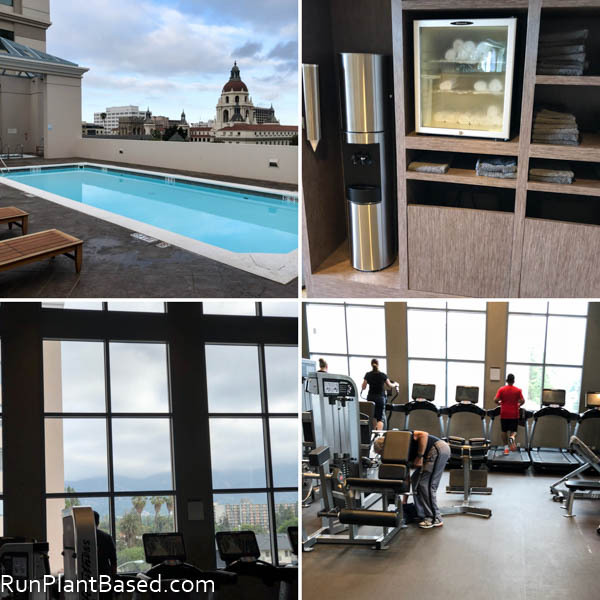 Instead of disturbing hubby, I quietly headed to the hotel gym on the 4th floor with a great view of Pasadena and the pool. It was pretty packed for 7:30 am on a Saturday, I was impressed. After a decent 30 minute run and weight session, I grabbed coffee from Starbucks and headed back to the room to get ready. 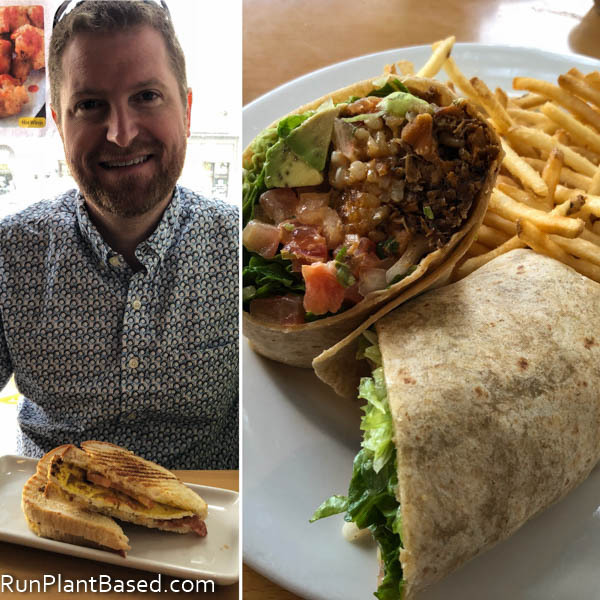 The festival didn’t start until noon, so we had some time to kill and the hotel was walking distance from One Veg World where hubby got his most favorite sandwich last year, the sunrise sandwich with tomato, vegan bacon, and vegan egg. 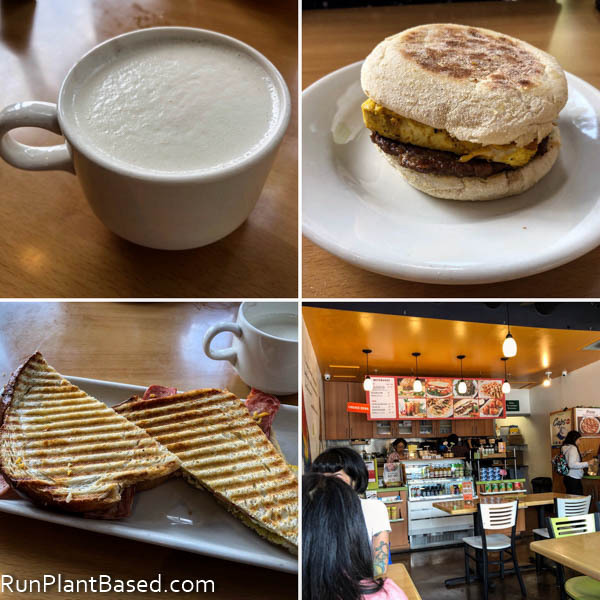 So we grabbed that, a vegan egg muffin sandwich, and warm almond milk for a light-ish breakfast and I gotta say, the warm almond milk was oddly tasty and soothing. 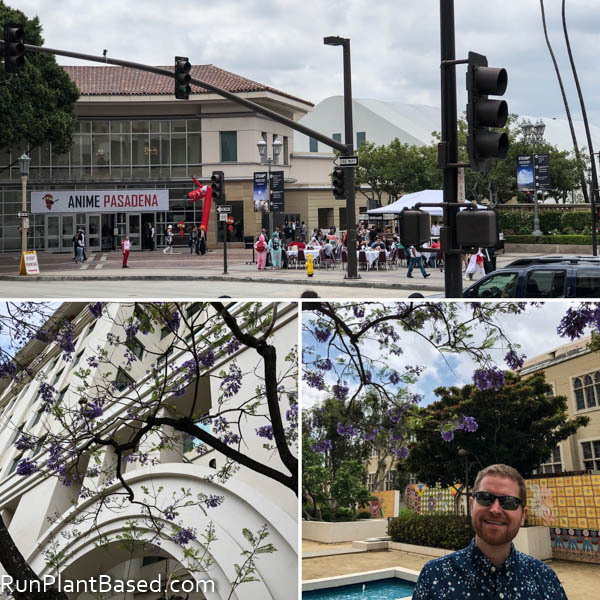 Then we explored the area on foot a bit checking out the shops and sights, even stumbled on the Anime Pasadena event with great costumes. 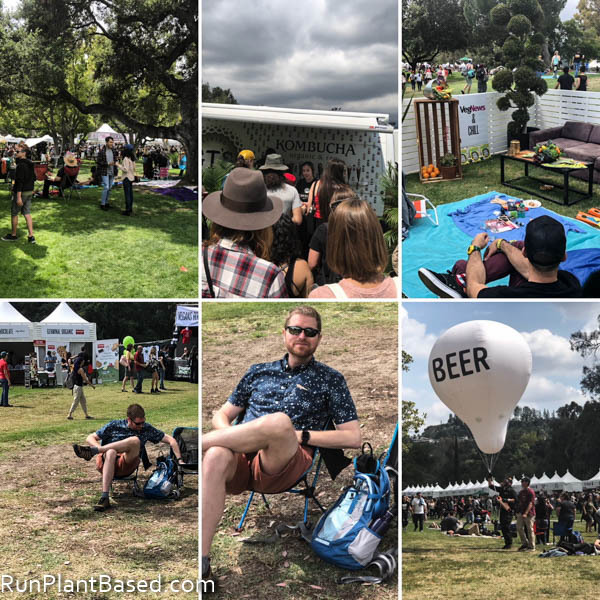 Finally it was time to catch our Lyft ride from the hotel to the festival at the Rose Bowl where we each got a glass to fill up with as much alcohol as we could handle at the various booths. And was greeted with a Matchabar drink and a yoga and wine session in progress. First impressions was awe at the massive size of this festival! 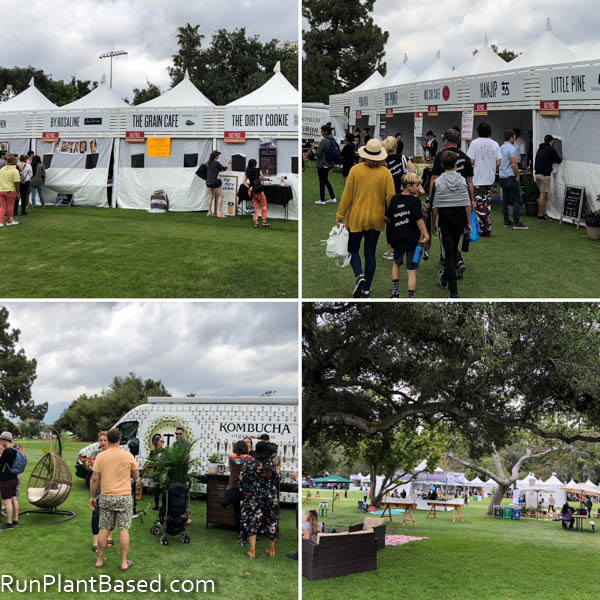 It covers the grounds around The Rose Bowl with rows and rows of booths with so much food, drinks, and shopping! Booths from restaurants, vendors, and products from all over the globe! I had no clue where to start! So we walked the grounds scanning the booths and trying to decide what types of food to start with. 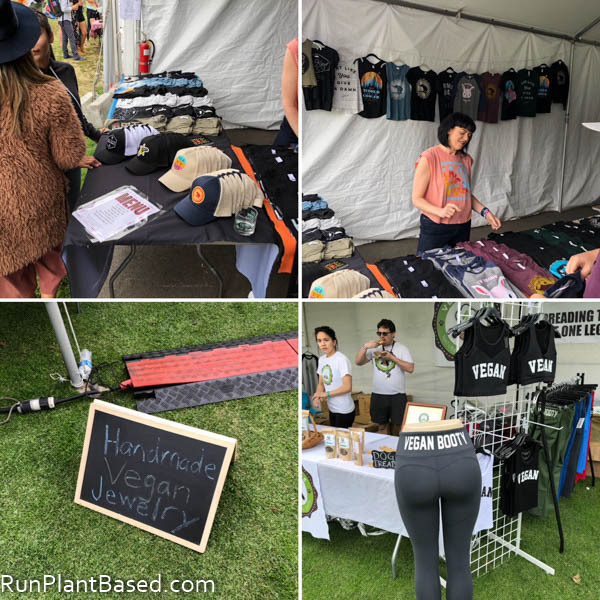 Vendors, including VegNews, had sitting areas set up for visitors to rest at and there were some tables and standing bars around. But for the most part attendees are responsible for bringing their own chairs, picnic blankets, etc. 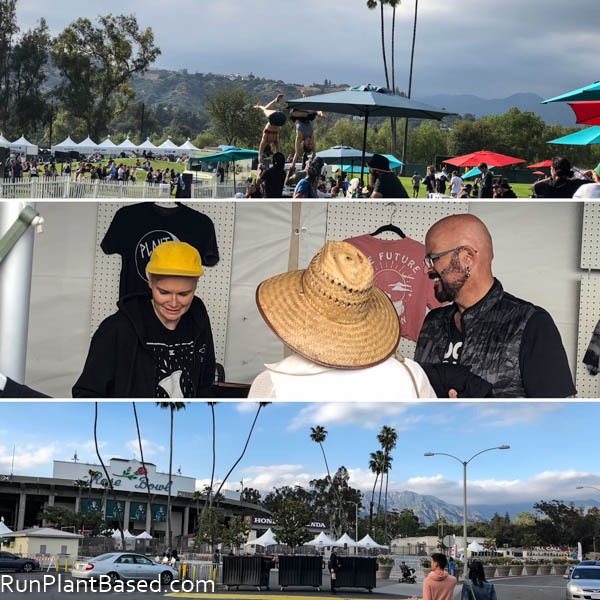 And I could have easily spent hundreds shopping at the product booths – Herbivore Clothing was there where I picked up a new gym tee and tons more vendors with vegan clothes galore! 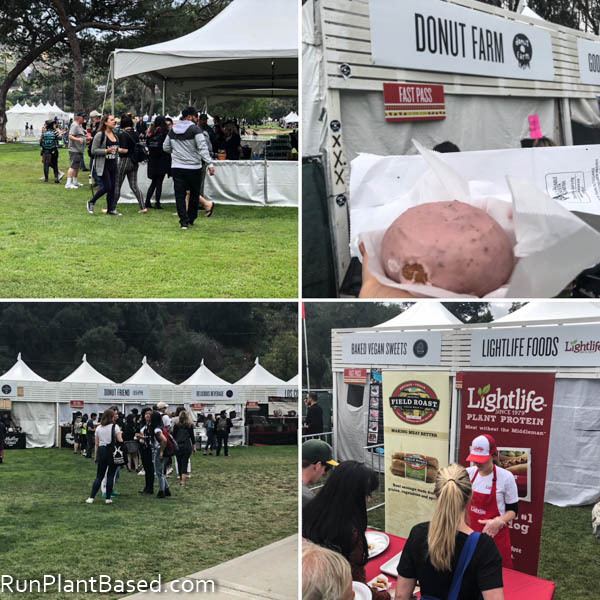 The first massive line we saw was for Temple of Seitan booth and it was that long before it the festival opened to general admission! I was tempted to wait it out, but there were too many other booths to try. 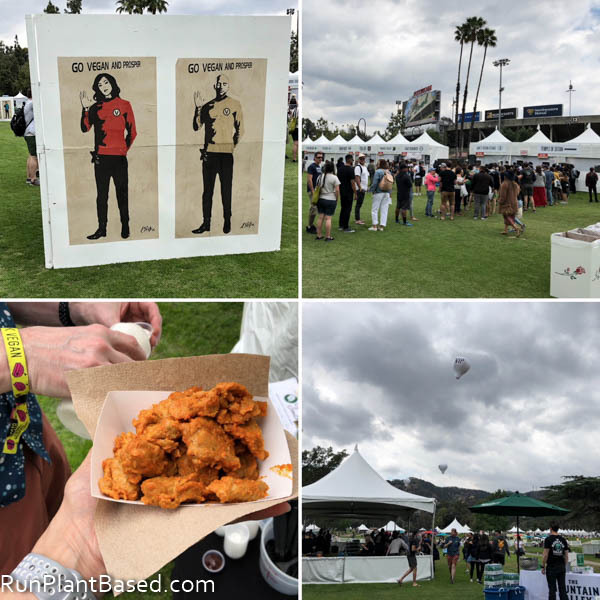 Instead we hit the Clean South booth to try seitan BBQ Buffalo Wings before heading to the VIP area. The VIP area had more tables set up and additional alcohol to drink, but still not enough tables for everyone and we were glad we brought our own travel chairs. Next we tried a rosemary berry donut from Donut Farm that was a uniquely sweet and tasty cake donut that was the perfect size to share. And this point I was feeling pretty good after a few mini glasses of beer and wine and stumbled across the The Herbivorous Butcher’s booth where there was no line by some crazy luck and they were serving an insane looking vegan version of a country fried steak double down with chicken-fried ribeye “steaks”, vegan hickory bacon, tofu egg, and vegan sausage gravy! I ordered one and it was ready about 15 minutes later. I was entertained by the excitement of others snapping pictures of the monstrosity while waiting. I was glad I only ordered one because hubby and I couldn’t finish it together and we really tried! As we sat trying to figure out how to eat it near another couple with one, people walked up asking where we got it because it looked amazing. A few minutes later, the line was crazy long for their booth and stayed long for the rest of the festival. It was delicious, the crispy fried texture on the fried “ribeye” steaks reminded me of fried chicken and the gravy was savory and a crazy treat. I think the non-vegan version would have been lethal! Next it was more exploring the rows and rows of booths sampling products, hearing from vendors, collecting loot, and taking in the sites. The weather was actually great, not hot or too sunny, and breezy. The food choices were overwhelming, so many options and not enough stomach space! There were also food demos and book signings. Many vendors had fun photo areas set up for social media. And we scored many beverages to try and enjoy to including GT’s Kombucha in my favorite flavor, Watermelon Wonder. 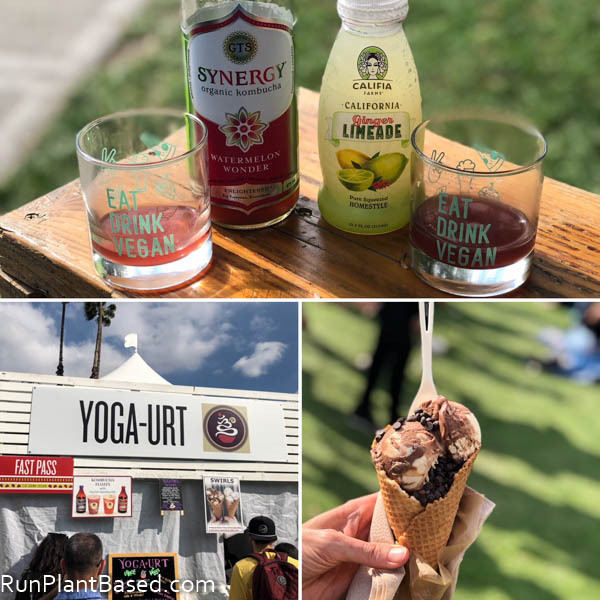 We wrapped up our food adventure sharing a decadent dessert from Yoga-urt, a fabulous and fun waffle cone with three chocolate peanut butter scoops topped with chocolate chips. And sat down to enjoy it while watching couples doing extreme yoga. Then walked around and did more shopping for goodies when hubby spotted Jackson Galaxy, or America’s Cat Daddy, shopping too! 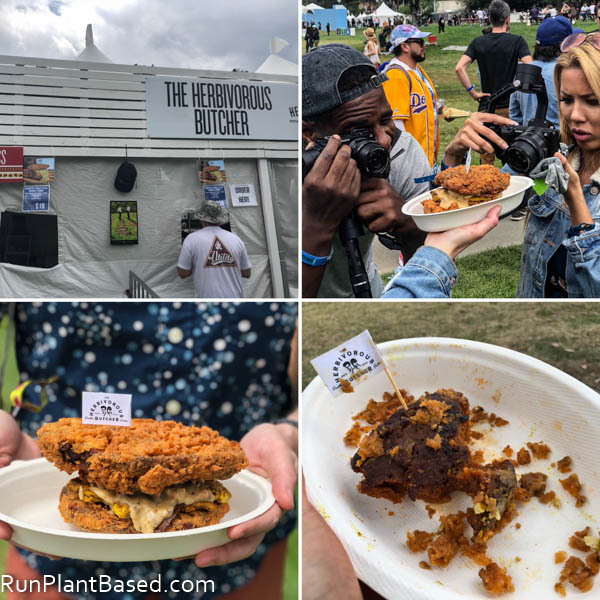 Overall it was an awesome festival, just seeing massive amounts of vegan food vendors and like-minded vegans alone was great and something we’ll do again for sure. But making the most of this festival is tricky because it is so huge, crowded, and full of choices. I’d recommend going with a big group of friends and set up a group seating area. Have friends divide and conquer to bring back one of everything to sample and share. It’s also a great place to meet many new vegans and make connections. It was a long day and very active, after a run and so much walking, I doubled my daily calorie burn goal and should have been wiped after two very packed and fun days. But I was actually feeling good and got up early again Sunday morning and went for a run around Pasadena. After we checked out, we headed to One Veg World again so hubby could get another sunrise sandwich fix. I got the spicy jackfruit burrito this time and it was great with spicy, tangy flavors, a great creamy and spicy sauce, avocado, and crispy fries. That might be my new fave! Then it was back to the airport to head home, boo. 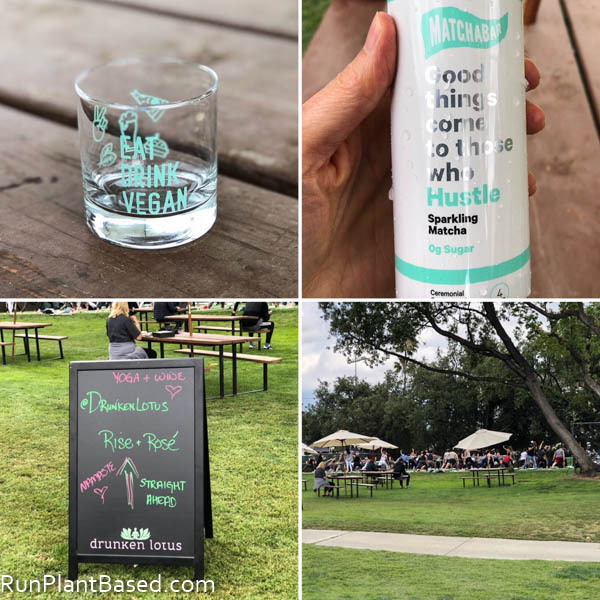 It was such a great trip to the LA area that I think we’ll need to make that an annual tradition to try new vegan options alone. I’m already planning our next trip! I miss LA so much… It kills me that I had to miss EDV this year. I’ve had the time of my life for the previous two events, and it looks like this one was just as fantastic. I’m already clearing my calendar for 2019! Me too already! Hope we can plan to hang out next year at EDV! That country fried “steak” is huge, and it looks amazing! We have something similar in Chicago and it’s always a fun day. It’s probably not as big of an event, but each year it grows. I’m really looking forward to this year’s event. It was great, but insanely filling! That is awesome, I would love to check out the Chicago event too!